(Sarasota, FL) "Authentic Florida Meets Real Florida," a special event presented by AuthenticFlorida.com to support Florida scrub-jay habitat restoration at Oscar Scherer State Park, is Friday, January 18, 2013, 10-11:30 a.m., at the Girl Scout Event Conference Center, 4740 Cattlemen Road in Sarasota. Emmy Award-winner and author Jack Perkins will serve as master of ceremonies. Speakers include the acclaimed Florida photographer, Clyde Butcher, and award-winning journalist and author Jeff Klinkenberg. The event is sponsored by AuthenticFlorida.com, a travel and lifestyle website devoted to the simple and delightful pleasures of Florida living. Tickets are $30 per person. A box lunch with the speakers follows for an additional $40. 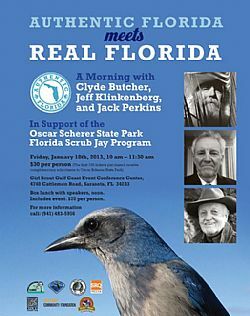 All of the ticket sales will support Oscar Scherer State Park's Florida Scrub-Jay restoration program. The first 100 ticket buyers get a free park pass to Oscar Scherer State Park. For tickets or more information about "Authentic Florida Meets Real Florida," call 941-483-5956 or visit www.FriendsofOscarScherer.com. “The idea behind this event is to help the threatened Florida scrub-jay," says Robin Draper, owner of AuthenticFlorida.com and organizer of this event. "By bringing together three speakers who represent real and authentic Florida, we create a synergy and celebration of Florida's beauty, character and culture. Our goal is to raise awareness and funds for the Florida scrub-jay habitat at Oscar Scherer State Park." For tickets or more information about "Authentic Florida Meets Real Florida," call 941-483-5956.